The Taber® Torsional Stiffness Apparatus - Model 108 has been employed to measure the relative stiffness of gloving leathers. 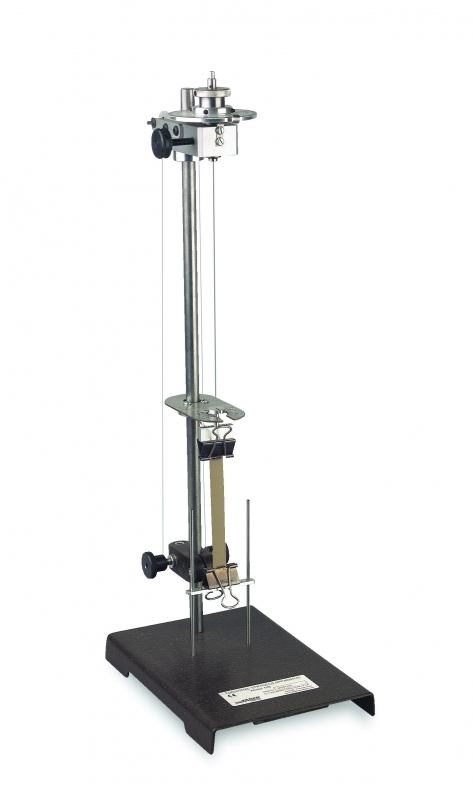 Based on the design described in ASTM D2821 (Standard Test Method for Measuring the Relative Stiffness of Leather by Means of a Torsional Wire Apparatus), this instrument is useful in measuring the flexibility and stiffness of a leather or other bendable specimen. The Torsional Stiffness Apparatus incorporates a torsion head and wire that translate a twisting motion to a 1/2" wide x 4 1/2" long specimen. Mounted to a rigid base and support post, the torsion head includes a dial protractor graduated from 0 to 360°. Made of 0.010 inch diameter tempered stainless steel wire, the torsion wire passes through the center of the torsion head in a loosely fitting sleeve gripped by a friction bearing. A fixed index pointer indicates the degrees of twist introduced to the torsion wire. Specimens are secured to the Torsional Stiffness Apparatus by two clamps. The upper specimen clamp is fastened to the lower end of the torsion wire and is able to rotate as the torsion wire is twisted. The lower specimen clamp holds the specimen in place which allows the twisting action to occur. To accommodate the twisting action, the lower specimen clamp can slide up or down guide posts mounted to the base. To operate the Torsional Stiffness Apparatus, the torsion head is rotated in a plane normal to the torsion wire. As the torsion head rotates, the torsion wire twists the test specimen. Mounted to the top of the test specimen upper clamp assembly is an indicator that measures the twist applied to the specimen until the specimen has been twisted 90°. An optional Finger Control Knob provides an ergonomic design that allows for two-hand operation of instrument, permitting a smooth twisting action of the specimen. Torsion values are obtained by measuring the applied angular twist required to reorient the sample 90° or some other specified setting. The following link provides a listing of test methods the Taber Torsional Stiffness Apparatus satisfies. Please note, additional accessories may be required.